Describes how to display inventory levels on the pricing form so users can see what is available, reserved for orders, and on order. Assumes that the accounting_ch_10-managing_inventory capability has been enabled, that there are parts entered properly, and that the pricing_ch_06-selection_lists is correctly linked to the parts to be used. We want the user to see as she is completing the Estimate or Work Order the inventory status of the part she is ordering. The report is based on Cyrious' Inventory Tracking. We start with an initial count of the parts on hand. These have a corresponding Part entry in Cyrious. Each part is linked to a line item selection is a list. When that item is selected, Cyrious decrements the On Hand Inventory category and adds the ordered amount to the “Reserved For Orders” category. 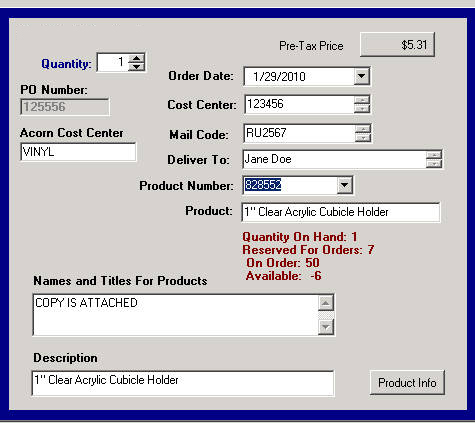 When a Purchase Order for the part is created in Cyrious, using the ordered Part, Cyrious adds the PO quantity to the “On Order” category. All these amounts are accessible with how-to_make_coding_easier_with_the_formula_builder such as PartByVariableName(“Acrylic Holders”) combined with the category desired such as PartQuantityOnOrder. These Properties are accessible through the Formula Builder. The information presented by this process is subject to some of the limitations of the Cyrious inventory tracking system which is excellent but not foolproof. Users should be aware that for really critical deliveries, a personal follow up to validate the information would be a good idea. Step 1: In Edit mode for the Pricing Form on which you are presenting the information select a Designer Label Object and place it on the form where you want to display the information. Be sure that there is enough space for 4 lines of text. Step 2. In the pricing_ch_18-pricing_forms, select the drop down list of the Property called “Display Info” and select Formula. + IF PartByVariableName( "SuntrustProductNumber").Part.QuantityReserved >0 Then "
+ IF PartByVariableName( "SuntrustProductNumber").Part.QuantityOnOrder >0 THEN "
+ IF PartByVariableName( "SuntrustProductNumber").Part.QuantityAvailable 0 THEN "